2) H.R.H. Prince (Sri Sri Sri Sri Sri Adhirajkumar) Nirajan Bir Bikram Shah Dev. b. at the Narayanhiti Royal Palace, Katmandu, 6th November 1978, educ. Kanti Ishwari Children's Sch., Tripureswar; Budhanilkantha Secondary Sch. and St Xavier's Sch., Godavari, Nepal; Eton, Berks., and Katmandu Coll. of Management. 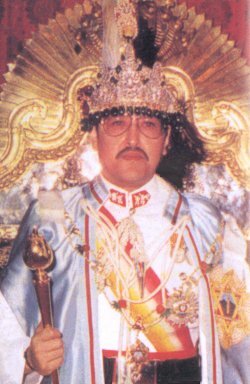 He was k. in the massacre of the Royal family, at Narayanhiti Royal Palace, Katmandu, 1st June 2001 (cremated at Aryaghat, Pashupatinath). 1) H.R.H. Suprasidha-Prabala-Gorkha-Dakshina-Bahu Princess (Sri Sri Sri Sri Sri Adhirajkumari) Shruti Rajya Lakshmi Devi Shah. b. at the Narayanhiti Royal Palace, Katmandu, 16th October 1976, educ. Kanti Ishwari Children's Sch., Tripureswar, and St Mary's High Sch., Katmandu; Mayo Girl's Coll., Ajmer, India, and Tribhuvan Univ., Katmandu (BA). Rcvd: the Order of the Gurkha Right Hand 1st class (29.12.1995), Silver Jubilee medal (1997), Bisista Sewa Padak (1999), GC of the Order of Merit of the Federal Republic of Germany (1996), and GO of the Order of the Legion of Honour of France (1994). m. at Katmandu, 8th May 1997, Suprasidha-Prabala-Gorkha-Dakshina-Bahu Kumar Gorakh Shamsher Jang Bahadur Rana (b. at Thamel, Katmandu, 17th February 1969), son of Keyur Shamsher Jang Bahadur Rana, by his wife, Sri Rani Ambika Rajya Lakshmi, only daughter of Mukhya Chautaria Bhupendra Prasad Shah. 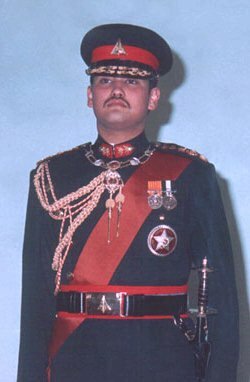 She d. at King Birendra Military Hospital, Chauni, from gun-shot wounds received during the massacre of the Royal Family, 1st June 2001 (cremated at Aryaghat, Pashupatinath), having had issue, two daughters - see Nepal (Lambjang and Kaski).